Boys Basketball Finishes Stellar Season; Spring Sports Fire Up! The boys basketball team’s historic season came to a close Wednesday night as they lost to a strong St. Patrick/St. Vincent team 60-42 in a first-round NorCal playoff game. Wei Wei Buchsteiner, grade 12, led the Eagles with 16 points, and Will Deng, grade 12, came back from a knee injury to contribute 10 points. Last Saturday, they took on, but were defeated by, multiple CCS champ Sacred Heart Prep in the league championship. Though the boys lost in their first-ever appearance in the section finals 48-37, they united the entire Harker community during a fun and spirited afternoon of exciting basketball. 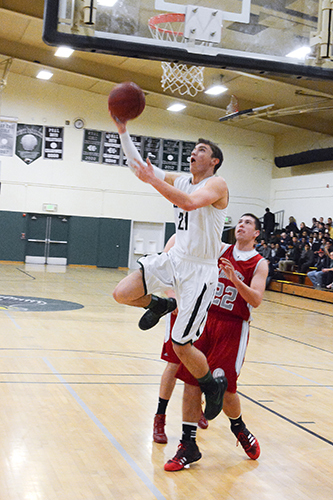 The boys ended with an 18-11 record and their first-ever appearance in a section final and NorCal game. Congratulations boys! Varsity girls lacrosse lost to Menlo-Atherton and Sequoia last week to open their season. The JV squad defeated Aragon 9-1 in their debut. The varsity team defeated Santa Catalina 17-14 on Wednesday in Monterey to earn their first victory of the season. Hannah Bollar, grade 11, scored 6 goals, Mary Liu, grade 12, recorded a personal high of five goals and Allison Kiang, grade 11, made three goals. Mabel Luo, grade 12, contributed with two goals, and defender Alicia Clark, grade 12, scored her first goal of the season. The entire team has improved dramatically since the first game of the season. Come support the girls as they play Burlingame at home next Tuesday! Meanwhile, Sidhart Krishnamurthi and Allen Huang, both grade 11, broke 13 seconds for the first time in their 100m races. Mehul Khetrapal, grade 10, won his race in the 200m and 400m. Lucas Wang and Winnie Li, both grade 9, took over the team long jump lead with fine jumps on Saturday; Li was also the top Eagle runner in the 100m. The team competes Saturday in the St. Francis Invitational. Boys golf opened league play yesterday with a 182-230 victory over Crystal Springs at Los Lagos. Shrish Dwivedi, grade 11, was the low scorer with a 32. The boys face Crystal again today at Poplar Creek. Softball lost to Fremont Friday in their opener 14-13. Hits were from: Tong Wu, grade 10; Sarah Bean, grade 11; Briana Liang, grade 11; Nitya Mani, grade 11; Alisa Wakita, grade 10; and Marti Sutton, grade 9. The girls face Silver Creek tomorrow at the middle school campus. Boys tennis placed third in their division at the Fresno Tournament over the weekend, winning four matches and losing one. Baseball started the season with losses to St. Lawrence and Washington last week.